Snuggling up in a quilt is one of life’s great pleasures, especially when it’s chilly or raining. Using that quilt regularly on your bed is a daily pleasure…until the dog throws up on it, or it gets dirty with grime or pet hair. When that happens, take a tip from quilters for generations back, and wash it. They often boiled their quilts in large kettles, punching them with sticks to get out the dirt. You can do the same — or wash your quilt in the machine on the ‘heavy duty’ cycle (after all, it’s heavy, isn’t it? ), using strong detergent. Then dump it in the dryer on high temperature, until the fabric feels hot and crispy to the touch. And the results will be just like those of your ancestors: loosened seams and ripped areas, faded fabrics and stains that are permanently imbedded in the fabric. Do you want that? Please note: washing any antique textile is at your own risk, though a calculated one, and there are some textiles that due to their unusual fabrics, workmanship or origins, really do need to be handled by a professional. These instructions are for cotton quilts only; the full instructions should be read carefully before you proceed. 1. First, double-check your quilt’s fabrics for colorfastness. Dampen a q-tip and run it carefully across the quilt’s surface, touching as many fabrics as possible. See any color? Those fabrics will have a tendency to run. (Or “crock,” in the appraiser’s dictionary.) 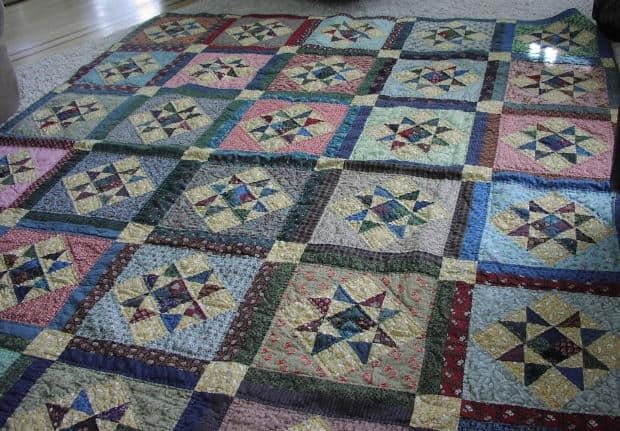 If your quilt is heavily stained or smells bad, you may need to wash it, anyways. At least you know the chances you’re taking. Mix in the cleaners, then gently add the quilt, pushing it down with your hands to thoroughly submerge it. When the water is full, turn it (or the cycle) off. Let soak for a few hours, or overnight. 4. If you’re using a front-load, dump the quilt, water and all, into the machine. Set for a ‘gentle’ cycle, and go straight to ‘rinse.’ Repeat the rinse cycle, to make sure all of the soap residue is out. 5. If you’re using a top-load washer, turn the cycle back on — but go to ‘spin.’ (It’s the agitation that wrecks a quilt, the same as a ‘battling stick’ or scrub board.) Allow the machine to continue to the rinse cycle, let the washer fill. Turn off the cycle, then gently push the wet quilt up and down in the fresh water. Turn the machine back on to ‘spin’ and finish. Rinse and spin a second time, just to make sure all the soap residue is out. I use a triple clothesline, distributing the quilt’s weight between all three lines, but a single line will do. So will a banister or deck rail, but be sure to put down towels first. The quilt should not touch wood directly, no matter what. Gently tug the corners and edges even as you spread the quilt. (Think “blocking,” same as for damp needlepoint or other handwork.) 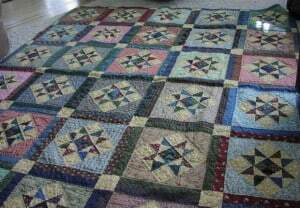 Keep light and heat to a minimum, but the quilt can, like the one below, handle a certain amount of fresh air and sunlight. Let dry. 7. Spread your freshly-washed quilt on your bed or couch, then enjoy its clean smell. Quilts are, after all, meant to be used and loved.